Airtel is here again with another mind blow offer since two days back Airtel NG has been sending numerous messages to some or all of their customers concerning their new offer. This offer will do you more good as you will get huge amount of data bundles at a very cheap price. 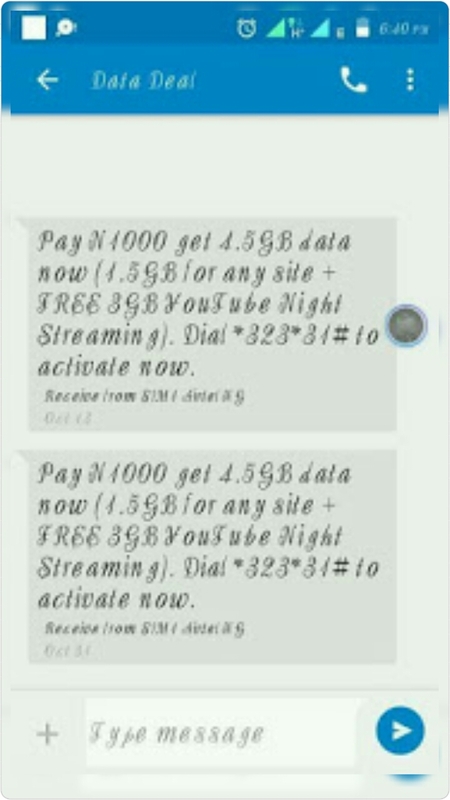 The message was to offer free 1.5GB as your normal data plan and 3GB YouTube night streaming. Airtel Youtube Pack is more like having a normal Android Subscription, and also a YouTube subscription. So when you stream, only the YouTube data will be deducted, while normal Android data is removed for other usage. 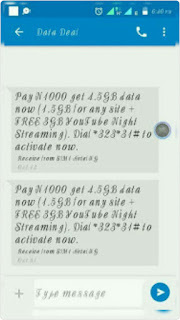 Once you subscribe to this plan, you will receive 1.5GB + 3GB data; all for N1000. The 1.5GB can browse any site at any time, while the 3GB works only on Youtube at 1am to 5am. Simply Dial *323*31# to activate. Validity is 30 days. Airtel is up with another new way of dragging customers attention but not in a good way, the 3GB supposed to be restricted for the day not night.